I'm not a religious dude, but I love churches; particularly very old and very European ones. Whenever I'm wandering in a part of Paris that's not super familiar to me, I always try to stop in every church I see. I'd actually never been in the Abbey of Saint-Germain-des-Prés for my first several years in Paris, just because it's in a neighborhood I normally didn't hit very often, and the times I'd walked by there I'd just been in a hurry to get somewhere else. 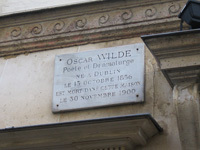 But one day when I happened to be in the Saint-Germain-des-Prés area to take pictures of the plaque outside the hotel where Oscar Wilde died, I decided to stop in the abbey to check the place out, since it's right down the street from Oscar's place. The abbey is gorgeous on the inside, but not too different from the style you'll see in medieval churches all over Paris and the rest of France. 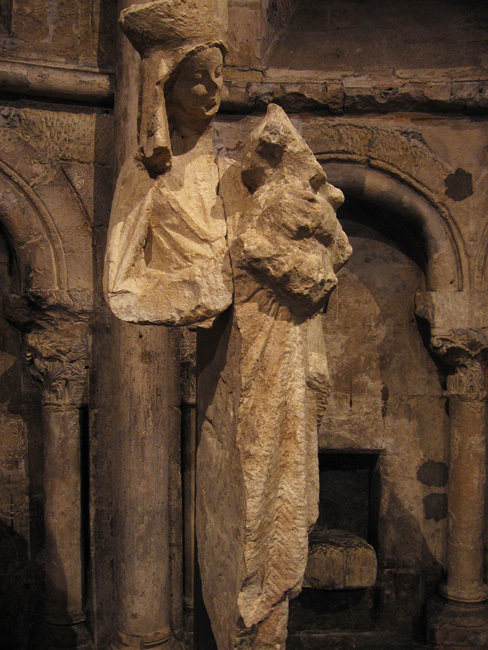 But one thing that really struck me, enough that I immediately wanted to run home and write an article about it, is this 13th-century statue of the Virgin Mary that's all the way in the back of the church. 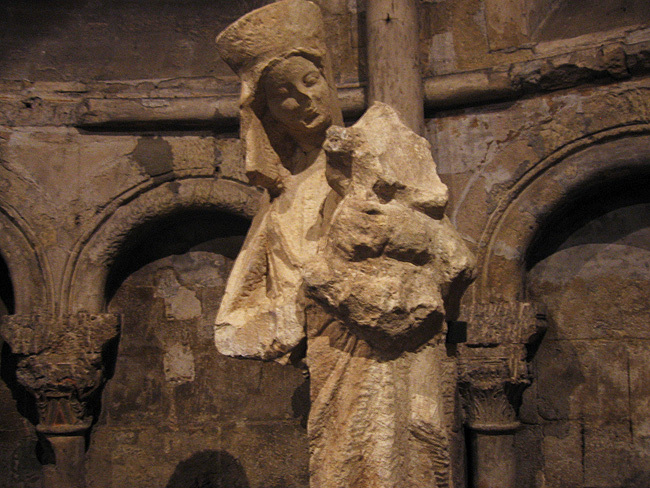 This statue of the virgin with child is reassembled from three pieces of rock discovered in an archeological dig on the Rue de Furstenberg in 1999. The sculpture, most likely intended to adorn the entrance to the old Chapelle de la Vierge, was probably left unfinished due to an error in its size, and the stones were reused in the foundation of a wall. 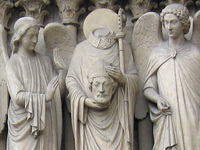 The simplified style of the crown and the lines of the virgin's face, and the slight incline of the virgin's head toward the child make this work a moving testimony to the great quality of Parisian sculpture in the 13th century. Rue de Furstenberg, where the fragments of the statue were found, is just a couple blocks to the North-East of the abbey, and happens to be where the Musée Eugène Delacroix is located, if you're interested. The "old Chapelle de la Vierge" that's mentioned in the sign is referring to the chapel of the Virgin Mary in the Abbey of Saint-Germain-des-Prés itself, where the reassembled statue is now displayed. Imagine how this statue, some anonymous artist's hard work, was abandoned and ended up buried, helping hold up a building for the last eight centuries or so; imagine the generations of Parisians who lived there and worked there who never knew it was under their feet the whole time, waiting to be dug up at the end of the 20th century. Imagine the reactions of the archeologists who discovered this beautiful statue while expecting to just find a lot of plain building stones. Imagine what other amazing things might be buried underneath Paris, waiting to be found! I drive myself crazy thinking about this stuff; it's too much for my brain to handle. Update: on a recent visit to the Abbey, I discovered that they've moved this statue to the center of the church, just to the left of the main altar. After checking out the statue in the Abbey of Saint-Germain-des-Prés, you can pay a visit to Oscar Wilde just a few blocks North, as I mentioned, and you can also stop for an overpriced-but-worth-it-for-the-memory coffee at Les Deux Magots, on the corner directly in front of the abbey, where guys like Hemingway, Sartre, and Picasso used to hang out. Not a bad way to hop through several centuries of Paris history in one afternoon!